Jinhae-gu (Hangul: 진해구, Hanja: 鎭海區) is a district in Changwon City, South Korea. This region is served by the Korean National Railroad, and is famous for its annual cherry blossom festival every spring. The city front is on a sheltered, island-studded bay, and is almost completely surrounded by mountains covered with pine trees. The emblem of Jinhae contains a cherry blossom. Jinhae was developed as a naval base (Chinkai Naval Station) of the Imperial Japanese Navy during the Japanese occupation period in the early 20th century. 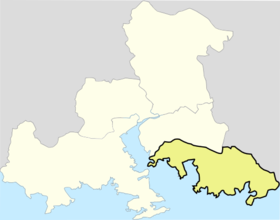 On July 1, 2010, Jinhae and its neighboring cities, Changwon and Masan, merged to form the city of Changwon, currently the seat of the Provincial Council of South Gyeongsang Province. The city is primarily supported by the Korean Naval personnel and their families or people working for the Republic of Korea Navy shipyard and base facilities. Today, Jinhae hosts major naval facilities of the South Korean navy including Commander-in-Chief Republic of Korea Fleet (CINCROKFLT) and the Naval Academy. Jinhae is part of a large urban corridor that links the adjacent cities of Masan and Changwon. These three cities merged as one in 2010, hence the name "Jinhae-gu" instead of "Jinhae-si". Moreover, the city is also host to the only US Naval base in Korea, US Naval Fleet Activities, Chinhae. ^ See official festival site  accessed 10 April 2013 See also pamphlet 'The 51 Jinhae Gunhangje Pamphlet' Changwon, Festival Committee of Gunhanje, 2013. This page was last edited on 3 March 2019, at 11:55 (UTC).